Years ago, when I was new to catering, I was asked to make a menu for twenty strangers celebrating a 70th birthday. Though I had sold cakes before, cooked the occasional dinner party for friends, and even been a New York City chef, the prospect of serving a dinner solo was daunting. Nervousness gave way to boldness and I accepted the gig and set to work. For my first course, I picked a grilled peach salad. I had assembled something similar when working in a Greenwich Village restaurant and remembered the “oohs” and “ahs” that greeted the charred peach dish that looked impressive but was secretly quite easy. On the day of the event, I prepped my peaches and escaped the heat of the kitchen to grill outside on a beautiful summer day. However, as I stood delicately turning each peach the sunny day soon turned gray, then black, as the skies opened and rain poured down upon me ruthlessly. I patiently browned my final peach before snatching it up and bolting inside. I was soaked but the guests were delighted by my deceptively simple salad of sweet peaches, spicy arugula and homemade honey poppyseed dressing. 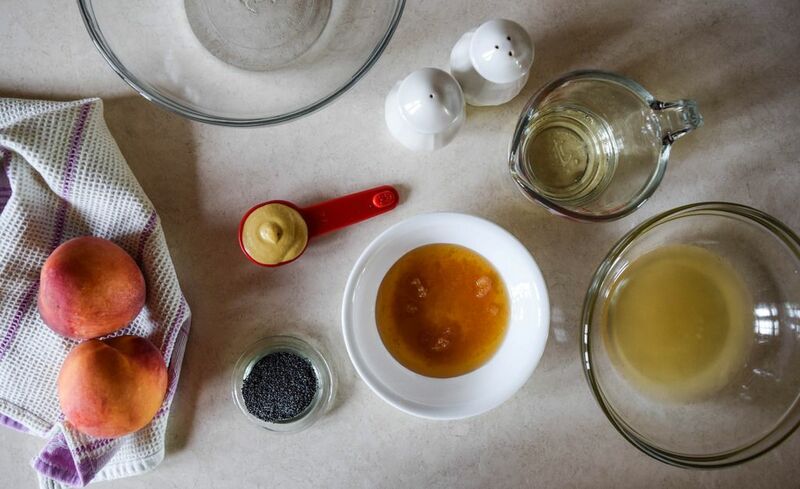 Start off by making the poppyseed dressing. In a medium bowl, whisk together the vinegar, honey, dijon mustard and poppy seeds until combined. While whisking, slowly drizzle in the oil until the mixture is emulsified. Add salt and pepper to taste. Next, prepare the peaches. Cut peaches in half and remove the pit. Then, cut each half into thirds so you have six sliced per peach. Each slice should be about half an inch thick. In a medium bowl, gently toss the peaches in the oil. 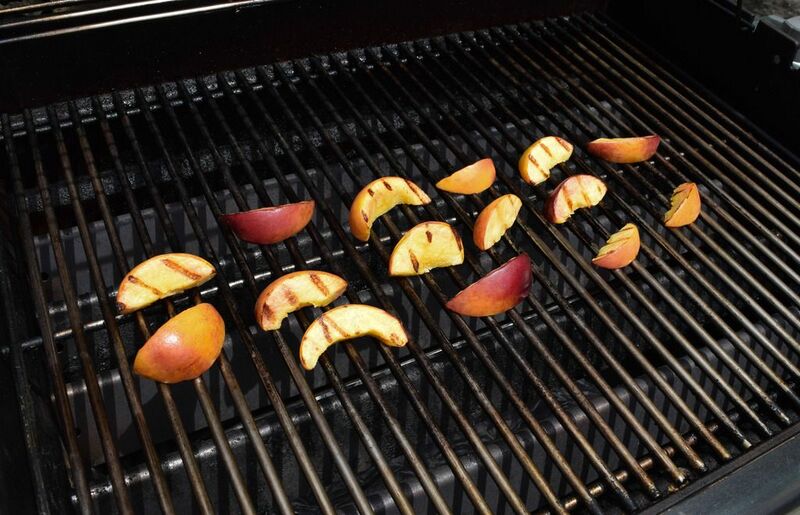 Place the peach slices on a preheated grill and grill for 4 - 5 minutes on each side creating nice grill marks. Only flip once. Finally, assemble the salad. Put the arugula in your serving bowl and add as much or as little dressing as you would like. 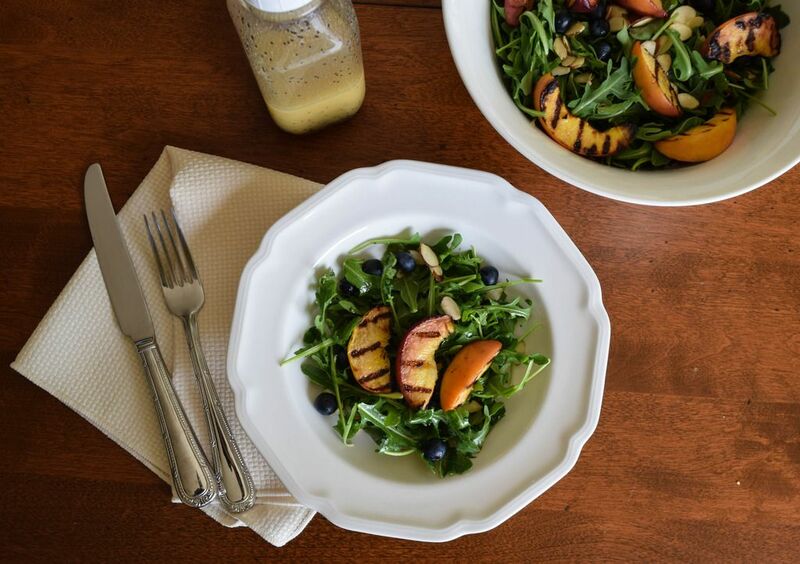 Garnish with grilled peaches, blueberries and slivered almonds. Goat cheese is a nice addition too.